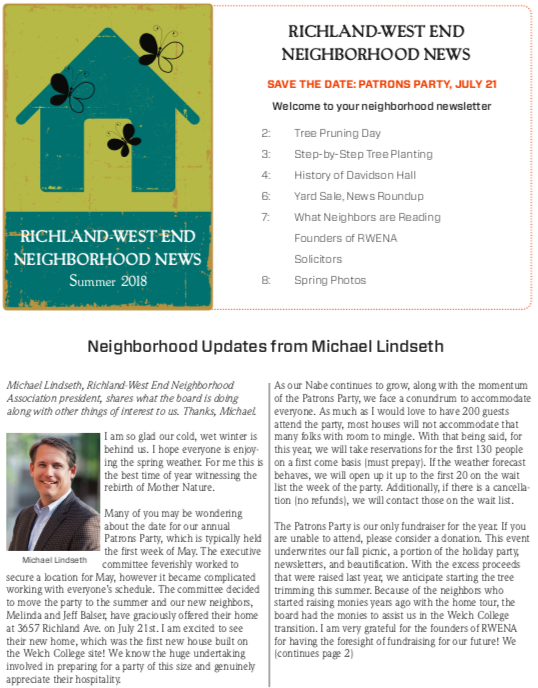 Our neighborhood newsletter is a great way to stay informed about neighborhood happenings. Newsletters are distributed quarterly, hand delivered to your door via your block captain. You can also use the sign up form below if you would like to receive them electronically. The October newsletter will be distributed the weekend of 10/12/18. Keep an eye on your mailbox, or access the electronic version here. Be sure to stock up on candy, Halloween is almost here. Find details on our neighborhood celebration. The annual tree sale is here. Order trees by 11/1, and they will be delivered to you 11/17. Don't need a tree? We still need volunteers to help plant, so sign up! Sign up with your email address to receive neighborhood news and updates direct to your inbox.